Select Size 4'x6'x1/2" 4'x6'x3/4" 4'x7'x1/2" 4'x7'x3/4" 4'x8'x1/2" 4'x8'x3/4"
Purchasing horse stall mats or mats for livestock trailers should be seen as an investment, not just a purchase. 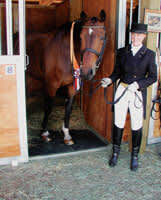 Horse owners nationwide have come to know and trust the Tenderfoot name for quality and reliability. Tenderfoot horse stall mats and trailer mats provide performance, durability, and appearance. This 100% recycled rubber livestock flooring provides cushion for animals, while also being resilient against animal secretions. 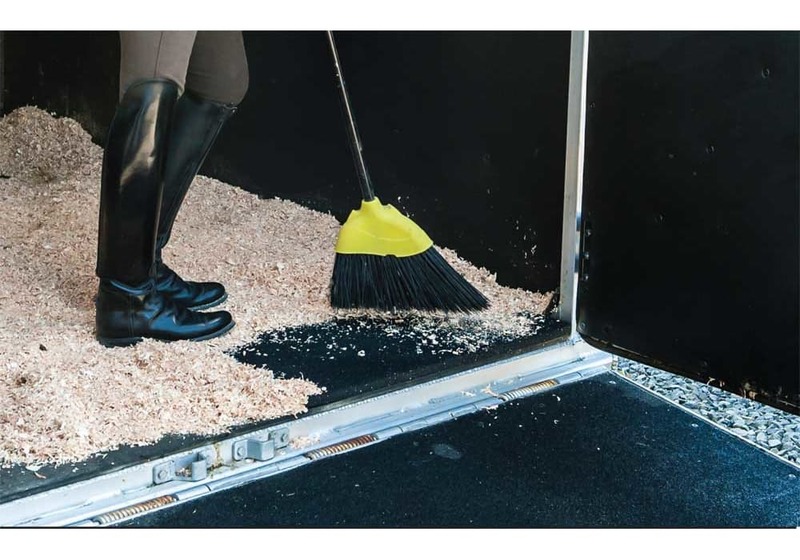 The non-slip, anti-skid surface is easy to clean and maintain, and will be your horse stall flooring or livestock trailer flooring solution for many years to come. Provides Excellent Traction – even when wet! Some of the benefits of our Rubber Horse Stall Mats / Livestock Mats include: Increased comfort and safety, Eliminate stall odors, Reduce stall cleaning time by up to 50%, Reduces injuries to animals, and Prevent damage to floors from pawing horses. These eco-friendly sheets of rubber stall flooring are manufactured in the USA from recycled scrap tires. These mats are commercial grade animal flooring. Made from SBR bonded granular recycled rubber. Density: ASTM D-3676, 60 lb/cf. The color is mostly solid black with randomly scattered flecks of possibly random color. Some areas may show more color flecks than other areas. Common Uses Include: Horse Stall Mats, Kennel Flooring, Dog Runs, Horse Trailer Mats, Trailer Flooring, Livestock Trailer Flooring, Wash Rack Areas, Barn Aisle-ways, Muddy Areas, Grooming Stalls, Tack & Feed Areas, Dog Agility Courses and Animal Chutes and Ramps. Note: Prices shown above include shipping within the contiguous USA. For larger quantity orders or any custom size up to 8'x10', request a quote below. 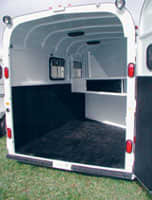 Purchasing rubber horse stall mats or mats for livestock trailers should be seen as an investment, not just a purchase. Tenderfoot rubber stall mats carry a 15-year limited warranty to ensure your investment is well grounded. Horse stable and farm owners nationwide have come to know and trust the Tenderfoot name for quality and reliability. 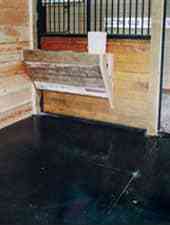 Tenderfoot horse stall mats and trailer mats provide performance, durability, and appearance. This 100% recycled rubber livestock flooring provides cushion for animals, while also being resilient against animal secretions. 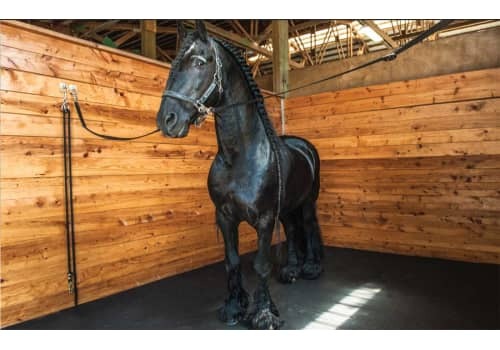 The non-slip surface is easy to clean and maintain, and will be your horse stall flooring or livestock trailer flooring solution for many years to come. These eco-friendly sheets of rubber stall flooring are manufactured in the USA from recycled scrap tires. Why Use Rubber Livestock Mats / Horse Stall Mats? Increased comfort and safety: Most stall surfaces - concrete, dirt, clay or aggregate (loose fill) floors - are hard on animals standing for extended periods of time. Large amounts of bedding are required to offer the cushioning support needed. 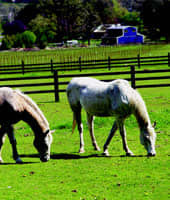 Tenderfoot rubber stall mats for horses are easily installed over any surface. Resilient, durable properties allow maximum support and traction, while anti-fatigue qualities reduce the amount of stress on your horse's legs, back and muscles. Eliminate stall odors: Tenderfoot rubber livestock mats are a full 3/4" thick and tight fitting. Use adhesives/caulking to seal and glue mats together with no large gaps along the walls or seams, or allow the bedding to pack into the seams, creating a natural caulking. This providesa surface which allows urine and waste to pool on top of the mat and be absorbed by the bedding. Since the bedding is absorbent, cleaning your stall removes nearly 100% of the waste, thus eliminating odor. Reduce stall cleaning time by up to 50%: With Tenderfoot Stall Mats, the amount of bedding needed is dramatically reduced. The mats provide cushioning support the horse needs, making it necessary to keep only enough bedding to absorb the waste. Your daily maintenance costs will be reduced up to 50%, saving both time and money. Prevent damage to floors from pawing horses. Dirt floors are difficult to manage and keep clean. Tenderfoot rubber livestock flooring / rubber horse stall mats decrease the effects of a digging horse by giving you an even floor, eliminating the need to refill holes previously dug. Grooved mats are not so great: Grooved mats appear to have great advantages over non-grooved mats. However, a mat is only as thick as its thinnest point. Grooved mats are an advantage to the manufacturer because they require less material to produce and can be sold for the same amount as a regular, non-grooved mat. This means that when you purchase a 3/4" thick grooved mat, you actually get the strength of a 1/2" thick mat. However, when installing a grooved mat over concrete, the mat collapses between the grooves. Over loose fill or aggregate surfaces, the grooves fill up, choking any ventilation the manufacturer promised. When installing grooved mats over any surface, the grooves become a prime area for bacteria to grow and multiply. 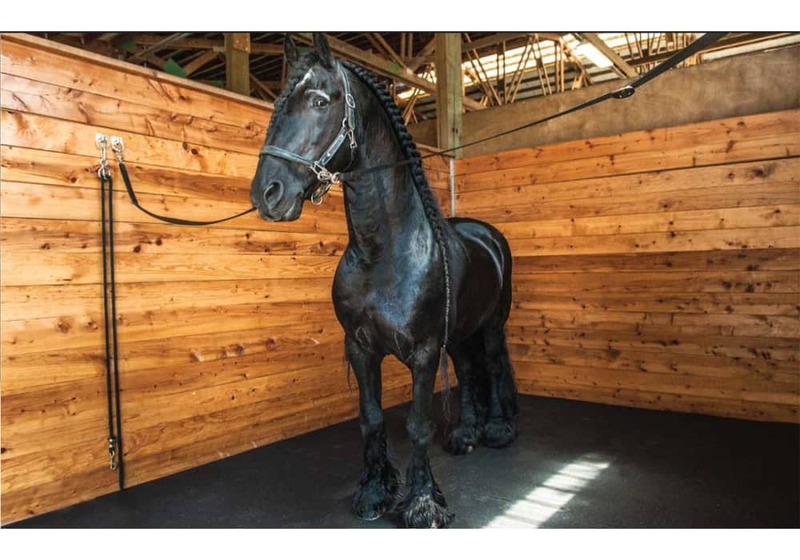 When laid down in a stall application, the draining feature works only when all of the grooves are lined up throughout the stall, which ultimately requires more matting in order to line up the grooves. Larger is not better: Large stall mats have drawbacks! 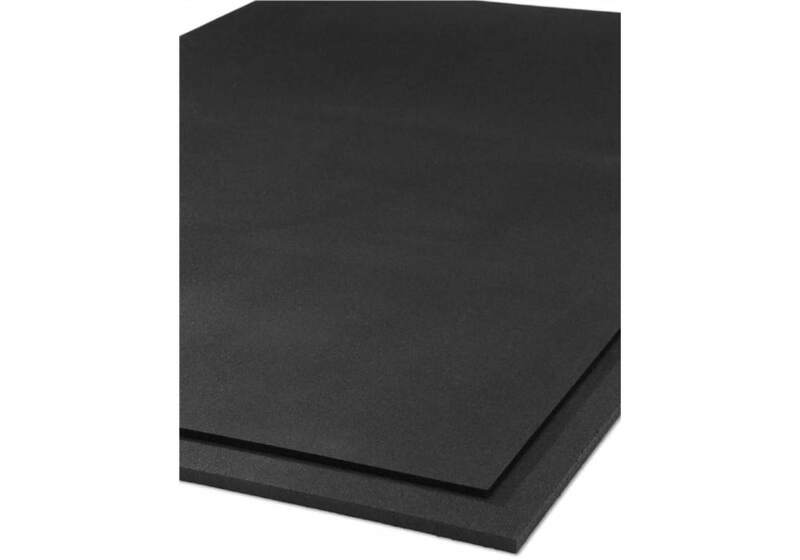 Large rubber mats, such as a 6' x 12', weigh up to 288 lbs. and were not designed for livestock use. In fact, they are normally made for conveyor belts and other machinery. Those mats are very hard and contain fibers such as nylon and rayon. These fibers do not expand and contract with the rubber, eventually resulting in curling, cracking and shrinking. Moving these mats also becomes a huge chore. 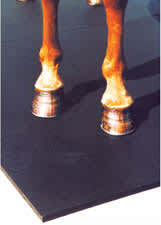 Tenderfoot 3/4" thick material is warranted only for normal horse stall applications. (3/4" thick mats may not be sufficient for draft horses under long-term use). 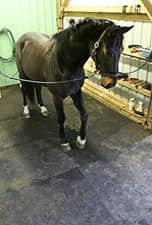 1/2" thick Tenderfoot Stall Mats are also available, and are warranted solely for use as trailer flooring, barn aisle-ways, or in stalls exclusively used for miniature horses. Made from SBR bonded granular recycled rubber. Density: ASTM D-3676, 60 lb/cf. Keep in mind, rubber always has a "rubber" odor that will diminish over time. Color: Mostly solid black with randomly scattered flecks of possibly random color. Some areas may show more color flecks than other areas. Guaranteed to be free of manufacturing defects in material and workmanship for 15 years. 3/4" thick mats are warranted only for normal horse stall applications. 3/4" thick mats may not be sufficient for draft horses under long-term use. 1/2" thick mats are warranted solely for use as rubber trailer flooring, barn aisle-ways, or in stalls exclusively used for miniature horses. Durable. 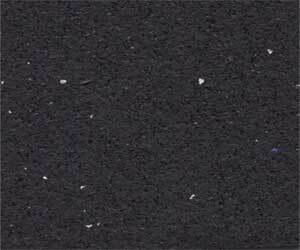 Made from premium recycled rubber particles, each product is specifically designed and manufactured for durability. Resilient. Anti-fatigue qualities found naturally in rubber are further enhanced by a space age polymer binder used during manufacturing. 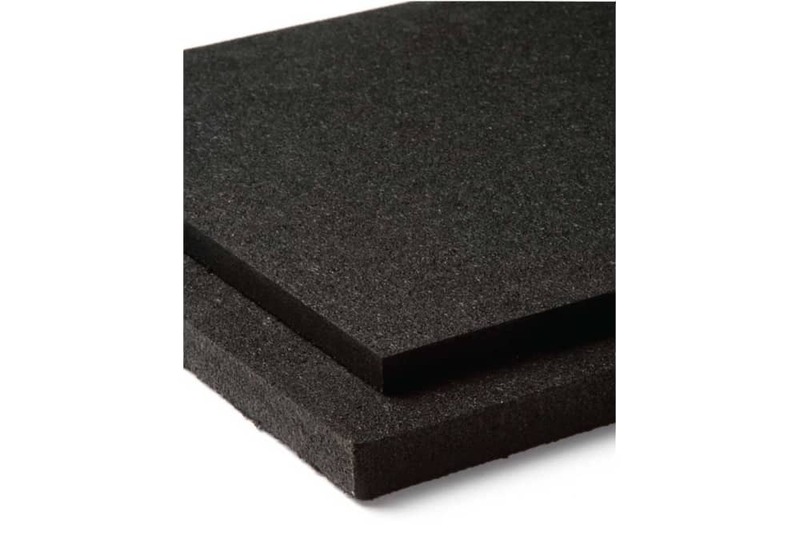 Each sheet is fabricated from thousands of rubber granules and offers superior underfoot comfort and resilience to cushion the shock from running, walking and standing. Designed to Provide Excellent traction... even when wet! Manufactured Entirely Within the USA. Only a handful of rubber sheet, mat or rolled manufacturers can say that their product is 100% American Made. Manufactured in Oregon, and raw materials come from within the United States. Manufactured of Premium Recycled Rubber. Free from fillers or contaminants and recyclable. Manufactured from 71%-88% post-consumer recycled rubber materials, namely scrap tires. Because of this high level of reused material, this product meets and exceeds the requirements set forth in Executive Order 13101, Greening the Government. Each year, the manufacturing of these and other rubber products prevents over 4 million scrap tires from being landfilled.